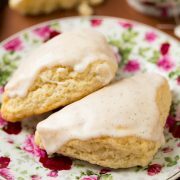 I never really used to be much of a scone person, but now that I’ve seen all that can be done with scones I’m crazy about them! 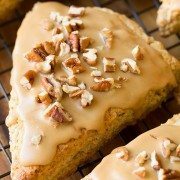 I’ve made Vanilla Bean Scones (also a smaller version like these), Pumpkin Scones, Maple Oat Pecan Scones and Cranberry Orange Scones. 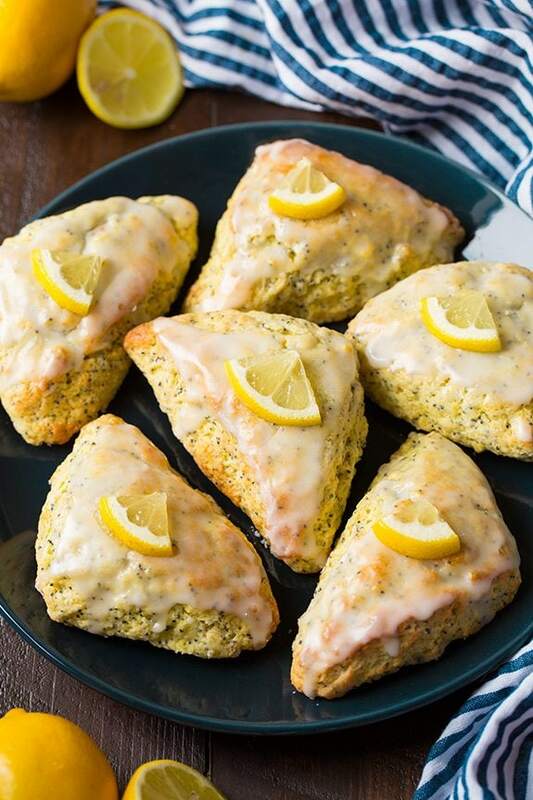 And to keep a good thing going I made these irresistible, brightly flavored Petite Lemon Poppy Seed Scones. These are such a delicious breakfast/brunch treat and they’ll most definitely remind you of a lemon poppy seed muffin or cake but with a little less sweetness. The dough for these may be a little sticky to work with, so with that said if you are worried about it you can cut back the cream 1 Tbsp or you can go for it and be willing to work with a slightly sticky dough because in the end it will yield a moister scone. 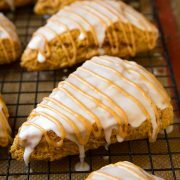 Don’t be stingy with the glaze on these because it really is a crucial part of these scones, it adds a lot of their lemon flavor and it’s the finishing touch that gives them just the right amount of sweetness that they need. If you really wanted to punch up the lemon flavor you could add a little more lemon extract but I think they have the perfect amount as they are, just enough to shine without being overwhelming. What’s not to love here? 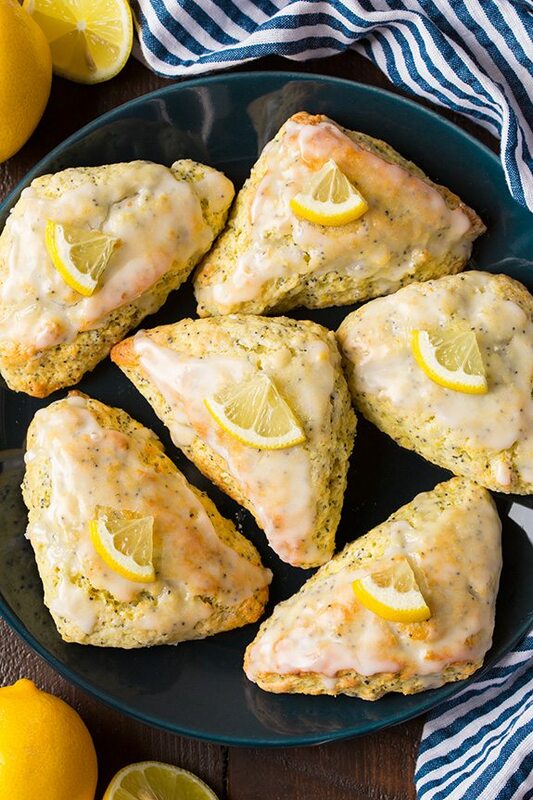 Lemon + Poppy Seeds + Scones + plenty of glaze, what more do we need in life :)? They’re the perfect spring treat, so treat yourself! 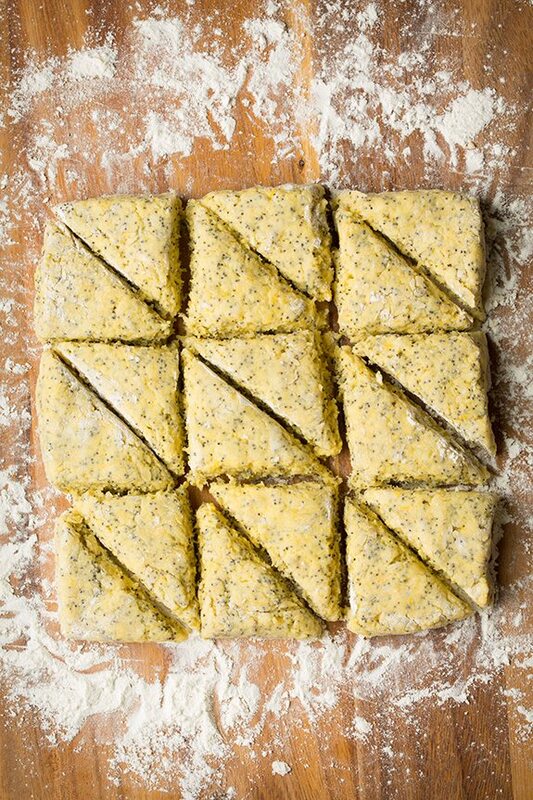 Delicious brightly lemon flavored, poppy seed flecked mini scones! Such a fun brunch or weekend treat! Makes 18 small scones. In a mixing bowl whisk together flour, sugar, poppy seeds, baking powder, baking soda and salt for 20 seconds, set aside. Add butter to flour mixture and cut into flour using a pastry cutter or fork until it resembles coarse meal, make a well in center of mixture. Chill mixture while preparing cream mixture. In a small mixing bowl whisk together 1/2 cup + 1 Tbsp of the cream, lemon zest, lemon juice, lemon extract, yellow food coloring if using and egg until well combined. Add cream mixture to well in flour mixture and stir using a spatula until it starts to come together, then gently roll mixture by hand several times until it has come together well (careful not to over work the dough or scones won't be as tender). Pour mixture onto a floured surface, dust top lightly with flour then gently pat and shape into a 7 by 7-inch square. Cut into 9 equal squares, then cut each square in half on a diagonal to create two triangles (see photo above). Transfer to prepared baking sheet spacing scones evenly apart, and brush tops lightly with remaining 1 Tbsp cream. Bake in preheated oven 10 - 14 minutes until set. Transfer to a wire rack, let cool slightly then spoon lemon glaze over tops and spread to edges. Allow glaze to set at room temperature. Store in an airtight container. For the lemon glaze: In a small mixing bowl whisk together powdered sugar and lemon juice until well combined. If needed add a little more lemon juice or a little more powdered sugar as needed. Batter will be slightly sticky to work with but will give you moist scones in the end, if needed you can carefully wipe the knife clean with paper towels between cuts - and dust it with flour. For a more yellow color you can tint with a few drops of yellow food coloring if desired. Add it along with lemon extract. Deloris Monroe: Snowed in and made these this morning for me and my hubby. Deliciousness. I’ve made scones before, but these are the most tender, moist ones I’ve ever had.